There's an awful lot here for your money - too much maybe? The Giottos MT9170's quoted 12.5kg weight capacity tells you all you need to know about its solidity. You need a fair amount of muscle to manoeuvre those hefty legs into position, but once you have, you've got an extremely stable shooting platform. However, it's also a pretty complicated one. The base (not just the head) has a three-way pivot arrangement, and you can remove, invert and tilt the centre column. Two heads were supplied with our head - an MH1000 ball and socket head with friction adjuster and an MH5001 three-way pan-and-tilt head which is firm, but bulky. Although the Giottos is solid - there's not much wobble even at full column extension - it's fiddly to set up, there's a lot to understand and some of the base movements aren't that smooth. The column movement is a bit 'sticky', especially when you've got it in the horizontal 'boom' position, and there was some rotational movement in the column that took time to pin down because of the duplication of pan axes on the head and on the tripod itself. Even after this there was a little slop in the joint between the column and the head mount, though we presume that some adjustments with the supplied clip-on tool pouch would sort that out. 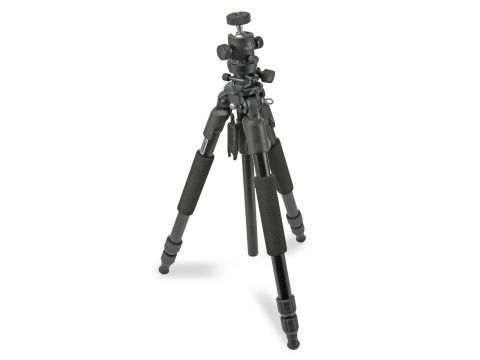 The ball and socket head is very nice, though - as you might expect given that it accounts for £80 of this tripod/head combination's £200 price tag. This is a massive, strong tripod whose weight and complexity mean it's best confined to the studio and relatively static positions. It's just a bit too heavy and complicated for general use.